« You Should Have Been Here Yesterday!! Getting Tired of Temperatures in the 70s LOL!! February and we are having days of temperatures in the 70s. This weekend, it was in the upper 70s and we are expecting that again this coming week. Wednesday and Thursday look like upper 70s. Back to the 60s Friday, and probably upper 50s over the weekend, then back into the 60s next week. What a February! No generation since last Friday night. Friday they actually ran less than 40 mwh early in the day, then shut down for a few hours and again less than 40 mwh at 4:00 p.m. which ran for a few hours. Today, the projection was 35 mwh most of the day, and as we stated in a report last week, 35 mwh much be their new norm for “zero” actual generation as they are not running anything right now. Wednesday Jim hit the last cool day last week. But, he had a very good day and caught some nice fish. Jim and Gina spent the day on the was fishing the ruby 2, black copperhead midge and stripping tiger tail. Several smaller fish, which we have seen a bunch of the last couple weeks, but a colorful 19″ male and fat, colorful 18″ female made up for the “dinks”. Stan had John from Oklahoma on the water Friday afternoon. Good day for John on the P&P and Ruby 2 midges. John is pretty new to the sport and he wanted to hone his midge fishing techniques. Fish were definitely taking midges Friday. Lots of fishers on the water this weekend. Weather was awesome and the fish were happy. Lots of good reports on gray scuds, ruby 2 midges, tiger tail. and the P&P. One guy came in and he had had a good day on the rusty midge. Oh, and don’t forget the red soft hackle. 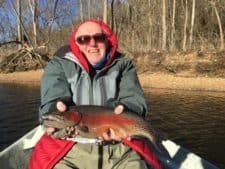 This entry was posted on Monday, February 20th, 2017 at 9:55 am	and is filed under Fishing Reports. You can follow any responses to this entry through the RSS 2.0 feed. You can leave a response, or trackback from your own site.